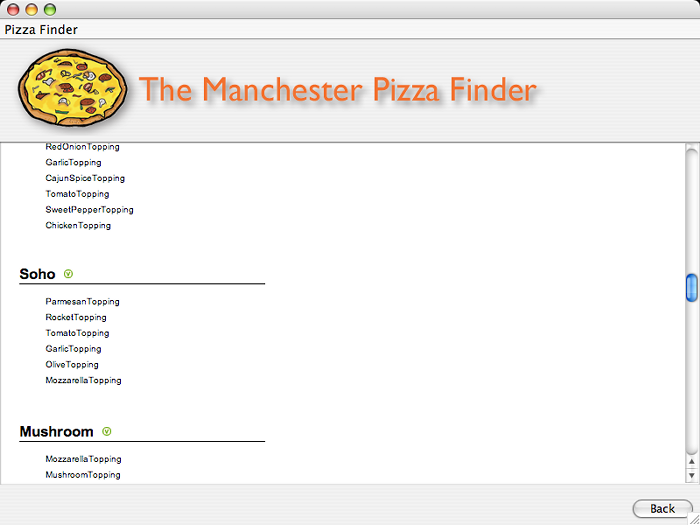 The Manchester Pizza Finder is a simple demonstration application, which uses the Pizza Ontology that is developed in the Protégé-OWL tutorial. 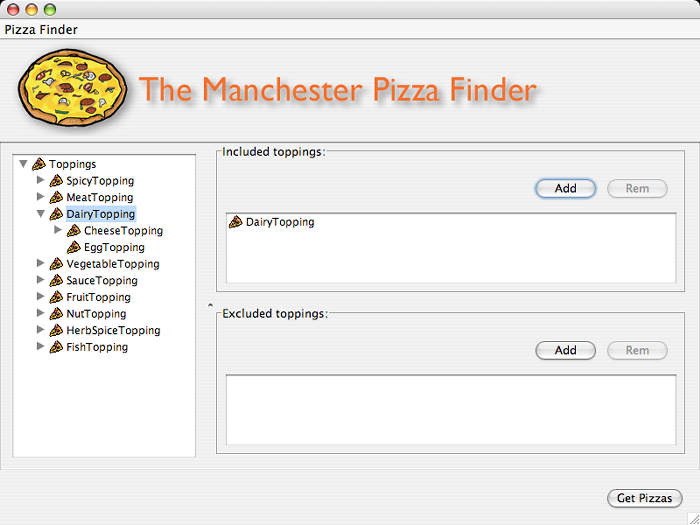 The Pizza Finder uses the Pizza Ontology, and a remote Description Logic (DL) reasoner to dynamically generate pizza toppings and pizza topping categories. The user can include toppings that they would like on their pizza and exclude any toppings that they do not want on their pizza. The description logic reasoner is used to determine if the choices that have been made contradict each other – for example, choosing to include Jalapeno Pepper topping, but choosing to exclude all hot toppings – the choices are automatically adjusted to modify any decisions that could potentially lead to contradictions and inconsistent results. Having made pizza topping choices, the DL reasoner is used to query the ontology and retrive the pizzas that satisfy the query. The pizza results are presented as shown below. The Pizza Finder Application is available via Java Web Start [click to download application]. Java Web Start will download the application and prompt you to choose whether or not to run the pizza finder application. Alternatively, or if you have problems, you can download and run it locally on your own machine.